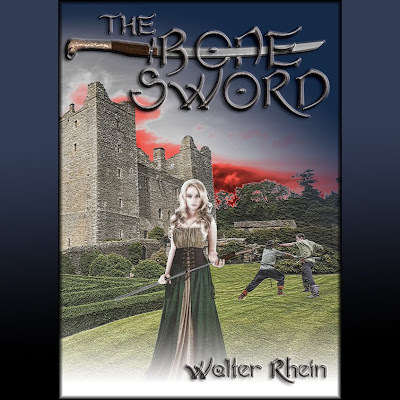 The Bone Sword is an action/adventure fantasy novel. I had initially conceived of it as a simple chase book, but the more people ask me about it the more I come to realize that it does deal with some pretty heavy issues as well. The hero is a swordsman named Malik who names himself as protector of a couple of orphaned children. Through no fault of their own, the children have run afoul of the local authorities and since they're just poverty stricken peasants, there's nothing they can really do about it. The local authorities forgot to factor for a guy like Malik in their calculations, however. I suppose the genesis for this book came from my time living in Lima, Peru. Although you sometimes encounter poverty in the US or Europe, you really don't know what poverty is until you go to a place like Peru (and even Peru is far better off than many of the world's nations). We've all read about societies that still have massive gaps in the fairness of treatment for people who belong to various social classes. However, until you've actually lived among it and seen it with your own eyes, it's pretty hard to fathom. There have been many times when I've seen somebody who was being treated unfairly and I was powerless to help him or her. I suppose most of that frustration makes itself known in "The Bone Sword." What makes you want to write fantasy? Fantasy is a convenient genre because you're able to make your points very directly yet still construct them within a storyline that's fundamentally entertaining. When it comes right down to it, your book has to be entertaining, and as a writer I feel that's my primary objective. However, I think a lot of the entertainment value comes from engaging issues that readers will recognize or have themselves struggled with. We've all dealt with an obnoxious co-worker or client or boss. In fantasy you can paint a portrait of these irritating people and then have somebody with a sword ride up and chop their heads off (it's very cathartic). I prefer to take a more realistic approach to fantasy. Up until now I haven't populated my worlds with a lot of strange characters or mythological beasts (however, I haven't completely explored my world, so beings like that might yet be out there). I also prefer to use a minimal amount of magic. I just don't like to take things like that for granted. If I'm going to have a minotaur or something in my book, there are going to be several chapters leading up to its introduction, and it's going to have a grand entrance, and so forth. You aren't just going to see minotaurs casually walking down the street brushing elbows with humans. Magic and mythological creatures are potent devices, and I think they should be used sparingly. The most important thing about building a world is obeying the rules you have imposed on that world. Still, to this point I'm a bit more interested in my characters than the world they live in. That's the kind of perspective that can change though...I guess it all depends on what fancy takes me when I sit down to write! What kinds of books do you read in your spare time? I read a little bit of everything. My degree is in English Literature so I have a pretty good background in the classics. Lately I've been studying to teach some Physics classes, so I have "A Brief History of Time" laying around. I recently picked up a copy of Lawrence Watt-Evan's "The Unwilling Warlord," which is just a good, solid fantasy romp. I'm also a big fan of Charles Bukowski. How long have you been writing and do you have any other books? I have been working as a writer for about 10 years. In the early days it was just short stories and freelance articles. Then I spent a few years as the editor of various small magazines and web pages. Being an editor is nice because then it's up to you what gets published and what doesn't (which makes it easier to place your own works). I signed my first book contract with epress-online back in 2007. The book is called Dominvs, and it's currently only available in electronic format. You can read more about that here. Yes, in fact I've already sold a manuscript that is a biography/travel memoir about my days as a cross country skier. I'm pretty excited about this book since cross country skiing is such a niche sport that nobody knows anything about. My publisher got pretty excited about this book as well, and he's recently published most of the first chapter on the Rhemalda web page just to get people interested. You can read more about that here. What is your favorite part about the writing process? That's an interesting question. I guess I've never really thought about that before. You know, it's all fun. I especially like the things that I hadn't anticipated. You think of writing as a solitary task, but the fact is it's a VERY social occupation. You're always meeting new people whether they are editors of ezines who are conducting interviews with you; or reporters and photographers from local papers or magazines who have come to get a story about you; or, most importantly, the fans of your work who meet you at book signings! But I think, when you come right down to it, my favorite part is the initial moment of creation. When I write I like to hack out 50, 60, or 100,000 words just so I have something to work with. Then you have to go through the book again and again and again (which can be a bit tedious...necessary...but tedious) and get it into shape. Nothing quite matches the high of just freely associating and creating and writing without any concern for how you're going to turn your inspiration into a published work. Yeah, I think that's my favorite part! Do you have a NaNoWriMo book to do this year? I know about this event, but I've never formally participated. Still, I like the concept. I think people get way too hung up on getting their writing "perfect" before they move on to the next chapter. It's far more important to take the story to the end and THEN start worrying about perfecting it. I think a lot of people don't end up finishing their novels because they spend a huge amount of time on an early chapter only to realize, when they reach the end of their book, that the first chapter is all wrong. It's fairly obvious that you shouldn't edit for grammar on your first draft, so why do people get so wound up over perfecting their scenes early in the process? Sometimes the reason the scenes don't work is because some part of you knows that you're not being fair to your characters, or your not obeying the rules of your world. In those cases, you have to throw the scenes out and go in a new direction. But the problem is that people spend so much time on these faulty scenes that they then are unwilling to throw them out. It's situations like these that make writing a book impossible. I think NaNoWriMo is the perfect exercise to help writers get over these perfectly natural blocks that stop them from finishing their projects. I'm actually supposed to be writing a sequel to The Bone Sword, maybe I should take advantage of the NaNoWriMo phenomenon and get it done! Hmmmmm...a VERY devious question. I was once told that there are three things you should never discuss, religion, politics and cats. My assumption is that you would only ask me that if you were a cat lover, and you want to see if you can get me to say something negative about cats (for some sinister purpose I can't perceive). However, it could be the case that you're a dog lover (or some other form of cat hater) and you are trying to get me to admit an affinity for cats AGAIN for some sinister purpose. All of this leaves me in something of a dilemma. Let me just answer by saying that although I greatly enjoy writing violent fantasy novels, I'm fairly adverse to violence in real life (this catharsis thing works people!). I'm definitely the type of person who leaves food out for animals just because I find it pleasing to do so, although I have to admit I'm not all that particular about what kind of animal eats the food. I don't currently have a cat, but I had one growing up. My wife and I have a new baby in the house now, so I don't suppose we'll be getting any sort of animal any time soon (except for a goldfish possibly...but seriously what kind of pet is a goldfish! Whoops...now I've gone and offended all the fish lovers, I guess it's time for me to cut my losses and just sign off!). Thanks for the interview, and be sure to check out The Bone Sword. There were several things I liked about Walter Rhein's interview. I found his social commentary notes on his experiences in Peru and Fantasy Fiction insightful. I agree that the foundation of a good Fantasy novel is action and suspense, but I also think that there is so much more that writers and readers can enjoy within this genre. It sounds like Walter found an excellent way to highlight poverty and class injustice within his story. I also think Walter's comments on first drafts were accurate. The more you write, the more it flows, the more the story makes sense. Re-editing, re-editing, and re-editing can be painful. There are various layers you can put into a story - plot, sub-plot, culture/mythos, character development and conflict, themes, allegories, etc. BUT you have to have a great story first...and that only comes from writing it. Thanks for the interview and thanks for the great comments. Good Luck! Lovely interview, and it sounds a lovely book too. Interesting, writing is social isn't it? Thanks for your comments! I greatly appreciate it! Also thank you for posting this interview! Great answers and very interesting connection to the poverty in Peru. Thank you Walter and Cherie!